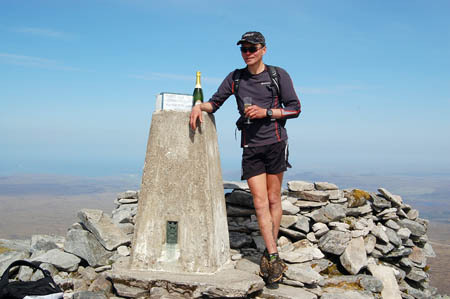 Ultra fellrunner Stephen Pyke has smashed the record for a continuous munro round. The 45-year-old Staffordshire known as Spyke touched the trig pillar on Ben Hope in the north-west Highlands at 3.06pm yesterday, Thursday, to beat Charlie Campbell’s 10-year-old record by nine days. Spyke achieved his muscle-powered round of all 283 3,000ft munros, cycling and kayaking between them, in 39 days, 9hrs 6mins. 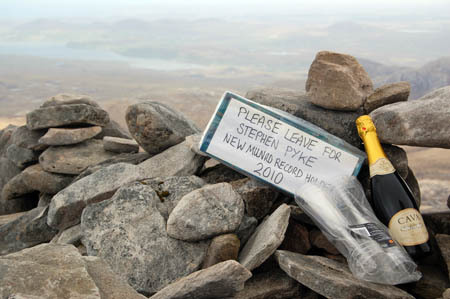 A crowd on the summit of the 927m (3,041ft) Sutherland peak greeted the runner and champagne corks popped to mark the achievement. And, in a magnanimous gesture, a parcel was found secreted in Ben Hope’s summit cairn, containing a bottle of single-malt whisky and a congratulatory message from the previous record holder Charlie Campbell. The run was completed in bright sunshine after a 15-mile cycle ride from the previous summit Ben Klibreck. The munro round was run to raise cash for conservation charity the John Muir Trust. Spyke, who only took up fellrunning in his 30s, was supported throughout by John Clemens, who drove his support vehicle, and by many fellow runners who help pace the record breaker on his ascents of Scotland’s munros. For the sake of completeness, and to match Campbell’s previous route, Stephen Pyke also included the recently downgraded Sgurr nan Ceannaichean, which was classed as a munro on the 1990 record run but now fails to measure up after an accurate survey. Spyke’s run was even more remarkable for its early start, with much of the Cairngorm plateau still having deep snow cover during his traverse of the peaks in early May.